Writing began with drawing simple pictures, or pictographs as they are usually called, to represent an actual object or thing. You can see in the drawings on the left some of the early drawings that have been found on ancient Babylonian tablets. Eventually, the picture might come to represent not just the object but also an idea or concept connected to the object. This type of symbol is called an “ideograph” since it has expanded from representing a solid object to representing an abstract idea. For example, the drawing of the sun would come to mean also “day.” The drawing of the foot might come to include the idea of walking. In the final stage the symbol might morph into representing a sound, usually the beginning sound of the object it was originally picturing. The sun would no longer stand for the sun, for instance, nor for the idea “day,” but would now instead represent the sound “su.” Once a system of writing has reached that stage, it is what’s known as a syllabary with symbols representing syllables, and it is well on its way to perhaps becoming a true alphabet. In an alphabet the symbols represent smaller, more incremental sounds as in our own alphabet. So lots of changes have to happen over a long period of time for any true alphabet to develop. Along with changes in what ideas or sounds the symbols represent, the way the symbols are written changes too. In ancient Babylon (modern day Iraq), the pictographs were gradually “stylized” or simplified, sometimes they came to be rotated to make them easier to write. A wedge shaped stylus came to be favored as a writing instrument and that meant all the symbols were made with tiny wedge-shaped lines. So the script is called “cuneiform” because that means “wedge-shaped.” Cuneiform was the world’s earliest type of writing. It even beat out the hieroglyphs of Egypt. I remember feeling a little disappointed when I first learned that. I had always loved the special beauty and mystery of ancient Egyptian hieroglyphs. 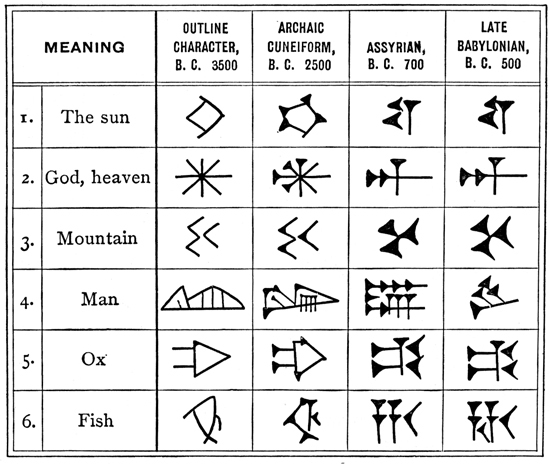 But cuneiform is every bit as interesting. Did you know that some cuneiform is so tiny it takes a magnifying glass to read it? Yet they had no such thing as magnifying glasses back then! Ancient Sumerian was a “language isolate”—it is not related to any other language that we know of. But Akaadian, the language of the people who set up the very first empire and who conquered Sumer (under the leader Sargon), was a Semitic* language. The Akaadians adopted cuneiform writing to their own language and cuneiform began spreading all over with different groups of people using it to write their own language down. In this same way English makes use of the Roman alphabet, but so also does Spanish, French, and German–all different languages making use of the same symbols, or letters, to write down the sounds of their own words. 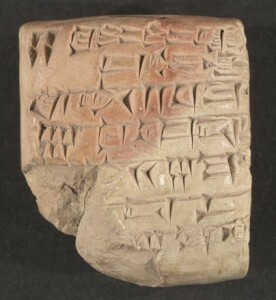 For a wonderful site to see more on cuneiform go here. And don’t miss this: Write like a Babylonian, an interactive site where you type in a short word or your initials and it gives them back to you in cueiform! *The term “Semitic” traditionally refers to descendants of Noah’s son Shem, this would include Abraham and all his descendants. Today, people usually mean Arabs and Jews. Answer to riddle: a school.